While I wasn't as enthused about the last installment as I had perhaps hoped, I was still quite looking forward to reading Wyrd Sisters, as Pratchett was definitely getting into the setting last time and I wanted to see what he would do with the witches as characters instead. Following the murder of the King of Lancre, the duplicitous Duke and his wife are determined to remove any evidence of their crime. This would normally mean killing off the late King's infant heir, but the infant ends up being protected by three witches: Granny Weatherwax, Nanny Ogg and Magrat Garlick. This intervention on their part is only the beginning, as forces beyond their control conspire to push them into bringing the rightful heir to the throne. I had met Granny Weatherwax previously in the Discworld novels, but she works so well against other witches, especially Nanny Ogg. 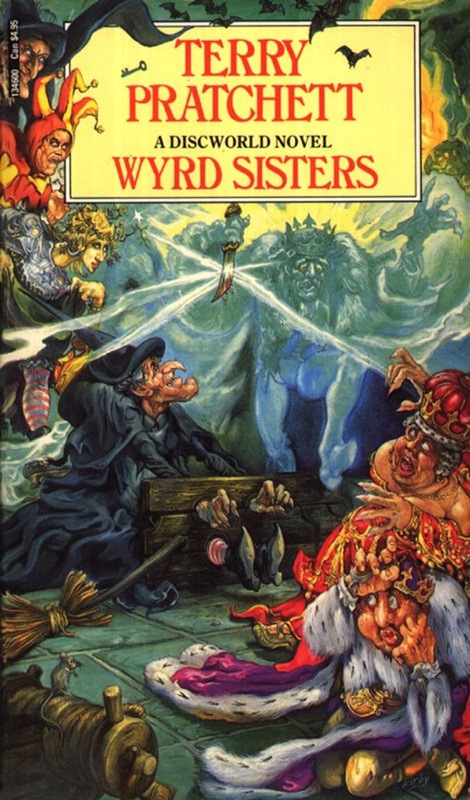 Even if the plot of Wyrd Sisters had been as weak as the last Discworld novel, it would have been well worth it for pretty much every scene that the witches are in. There aren't enough words to convey just how much these three characters work together, and I think I could possibly have been happy just reading their scenes. As it is, the rest of the plot is really quite strong, with some interesting riffs on the Macbeth style of coup d'etats that the story focuses on, and the beginning of a rather sweet romance. Honestly, I think the only weakness is that the parts dealing specifically with the acting troupe don't really work for me as much. But even that is kind of a stretch, seeing as they are still very entertaining and only really suffer for not having witches in it.